Since Monday’s horrific events in Boston, the hockey community has come together in support of the victims. 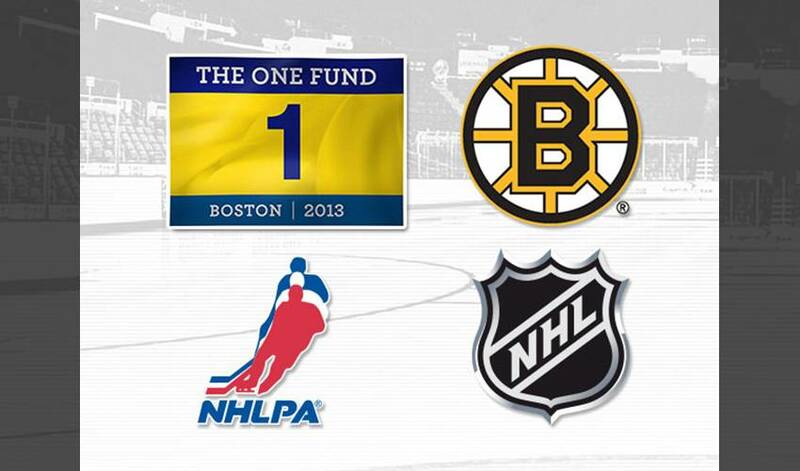 On Wednesday, the NHLPA joined the NHL, and the TD Garden in donating $50,000 each to The One Fund Boston. These funds go along with a $100,000 donation from the Boston Bruins to the same fund, for a grand total of $250,000. The One Fund Boston is raising money for families affected by the bombings. Bruins defenceman Andrew Ference spoke on behalf of all NHLPA members in underscoring the importance of supporting the families affected. “We are eager to support The One Fund Boston which will help the families affected by this attack not only on our community and home – Boston – but people from around the world who were enjoying this great event and city. The good will always be greater and more powerful than the bad and we hope that the actions of the first responders and the support of The One Fund Boston will help prove that” said Ference. Click here to read the press release on the One Fund Boston donation. Many people who followed the aftermath of Monday’s bombings remain unnerved by what took place. For Ference’s teammate, Shawn Thornton, there’s one image that he won’t soon forget in the wake of the tragic bombings that rocked Boston on April 15: a picture of eight-year-old Martin Richard at a Boston Bruins game, wearing a Bruins jersey and smiling into the camera. Thornton is still in disbelief over what happened. Thornton, like many of his teammates, had friends that were participating in the race that draws around 500,000 spectators every year, scores of people lining the streets for the 26-plus mile route. And, just as Thornton would expect, the man, like many others, rushed to the aid of the injured. On Tuesday, just one day removed from the tragedy, Thornton was still shaken by what transpired. On Wednesday night, the Bruins host the Sabres at TD Garden in Boston. The Bruins players and staff will be donating tickets to ‘first responders’ to Wednesday’s game, while members of the Bruins and Sabres will be wearing ‘Boston Strong’ decals on their helmets during the game. Bruins forward Brad Marchand will also be raffling off his TD Garden suite for the team’s first playoff game with the proceeds of the raffle going towards helping the Richard family. Thornton, the man behind the Shawn Thornton Foundation (dedicated to helping improve the lives of people affected by cancer and Parkinson’s disease) doesn’t need to be reminded it will be an emotional night when he and his teammates face-off at home against Buffalo on Wednesday. One of the game’s toughest players gave it his best shot.